Are you a fan of magical fiction? The Little Green Door is just that. 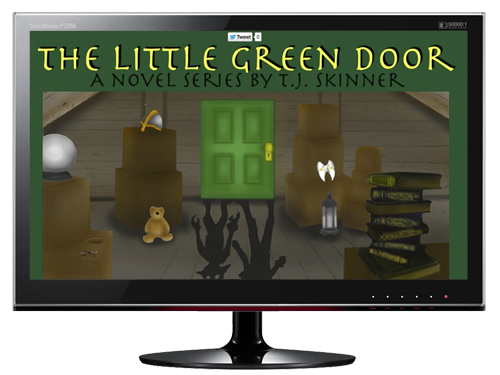 Check out Timothy Skinner's website for his book, The Little Green Door. You can read exerpts from the book as well as information about the author and more about the elements in the story. 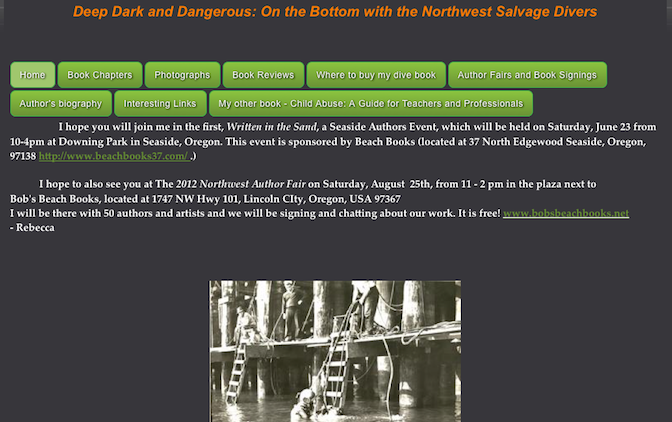 A great example of an author's website. If you're a fan of the SyFy network, you may have heard of a show called Ghost Hunters - a show where we as viewers get to experience what a real ghost hunt is like with T.A.P.S. (The Atlantic Paranormal Society). Well, if you enjoy that show, you'll love the featured website this week - G.A.P.S. (Gibsonburg Area Paranormal Society). If you are in the Gibsonburg area in Ohio and are hearing strange noises or bumps in the night, call G.A.P.S.! Currently, the site is in its early stages so reports of investigations haven't been added, but that doesn't mean they haven't been on cases! Keep checking back for updates on their adventures. Visit G.A.P.S at gapsparanormal.com ! If you ever find yourself in the Beaver, Pennsylvania just north of Pittsburgh and in the need a quality haircut, then look no further than Denise. For over 30 years, Denise has been styling and blow drying hair with amazing results. Her personal site provides a way to showcase her talents to potential new clients while being a great resource for her current client base. Spending time exploring her site is made is by the easy navigation and overall beautiful design. The services she offers are outlined under the Schedule Online tab and booking an appointment is a snap with her “book me” feature. There is even an Online Deals tab that provides monthly specials plus a mailing list sign up so that you never miss out on her amazing deals. 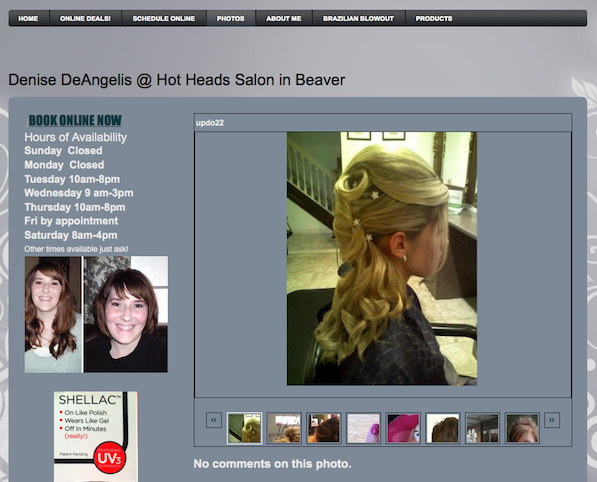 Great photos of her handy work can be found in the Photos section along with a wonderful candid photo of Denise with Tabatha Coffey of Shear Genius fame! Deep Dark and Dangerous is the terrific title of a thought provoking book on the perils of salvage diving and those brave souls who dared the murky Northwest waters. At times their missions were gruesome and not just for retrieving pirate booty. Photos of these daring men and excerpts from the book itself illustrate the danger involved with every dive. Author Rebecca Harrison’s website offers more details about the interesting novel itself and also where one can pick up a copy. You can even meet Rebecca herself at one of the many book signings listed on the site. The site also highlights another book the author has written and deserves a moment of exploration. This week's featured site will teach you more than you ever knew about the art of kung fu. 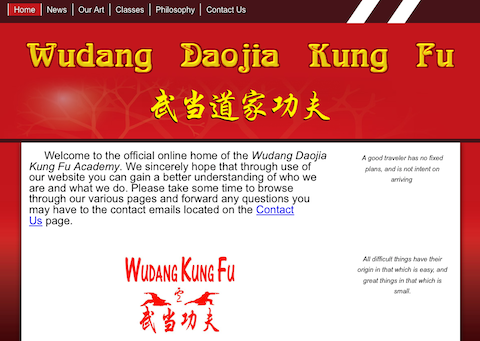 Wudang Daojia Kung Fu is an amazingly designed website with an abundance of information. The site is easily navigated and appealing to any admirer of great web design. Lu Shifu is the owner & Head Coach at Wudang. He trained in China and has over 20 years of Kung Fu experience. The website was built by one of Shifu's senior students, Joshua Perry. The website is enjoyable to peruse, learning more about their philosophy behind kung fu as well as the art itself. Unfortunately, Wudang is not open to any new students at the time, but you can join the waiting list! Cows vs. Visitors! If you ever imagined those gentle herbivores carrying pitchforks and rifles in an attempt to protect the Earth from Alien invaders, then you must check out Omni-miniatures! 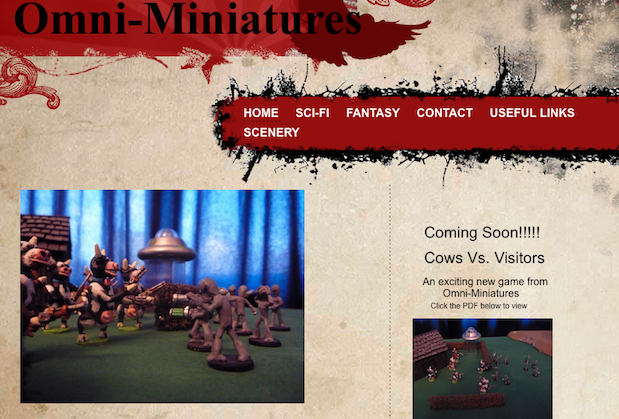 Omni-miniatures is a home-based business that specializes in manufacturing war gaming and RPG miniatures. You can easily find unique and creative Sci-Fi or Fantasy characters to help bring your game playing to life. The Colorado based company’s ordering process is simple and straightforward - tell them what you want and how many and after a simple PayPal payment your cool looking figures are shipped to your door. The site has numerous pictures of the various miniatures they carry plus scenery is also available to enhance your playing field. All miniatures come unpainted but the pictures on the site help you envision how you could characterize these great pieces. If you are new to roleplaying or not sure where to find a great game to get started, the site’s Useful Links section helps get you on your way. I remember watching my brothers play D&D for hours and none of their miniatures ever looked as cool as these. Did I mention there are cows battling for freedom?! Today's featured site comes to us from an awesome band as well as awesome website builders! 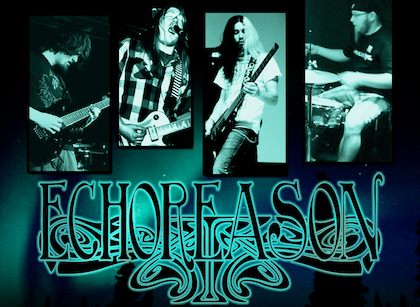 Echoreason, is a rock band out of Seattle, WA. The band started in 2010 and took a while to get up a website, but the one they have up now is amazing! Echoreason has a super-easy to navigate website. You can read how the band got their start in the bio, listen to some music, and check out their tour dates. Currently it looks like they are currently sticking around Washington, but maybe if we get them enough traffic they'll be able to venture elsewhere! Check out their site and listen to their music today! Visit echoreason.angelfire.com! Social Networking for the Dead might seem a bit unusual but the folks at ObitCity.com have created a destination where the good memories of those who have passed on can be shared. The extensive site is a labor of love where each submitted obituary is typed into an extensive database that can be easily searched. With modest beginnings, the site has since grown to include entries from all 50 states. The volunteer “staff” know how healing sharing words on the life of a departed one can be for a grieving family. The layout provides easy navigation so you can learn more on how to submit an obituary or what’s new on the site. ObitCity has a section on how they can help you either write an obituary or assist in hosting sites for a funeral homes to get them better exposure. 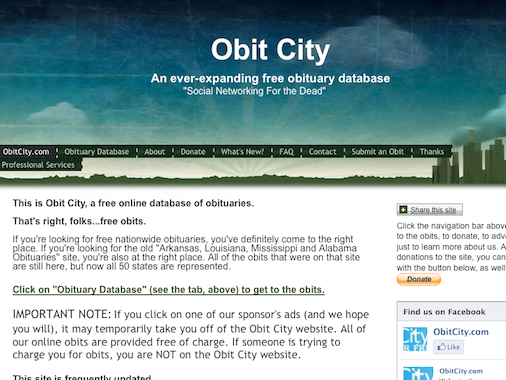 ObitCity.com might seem strange on first pass but I highly recommend you dig a bit more deeply because the site is a tremendous resource. 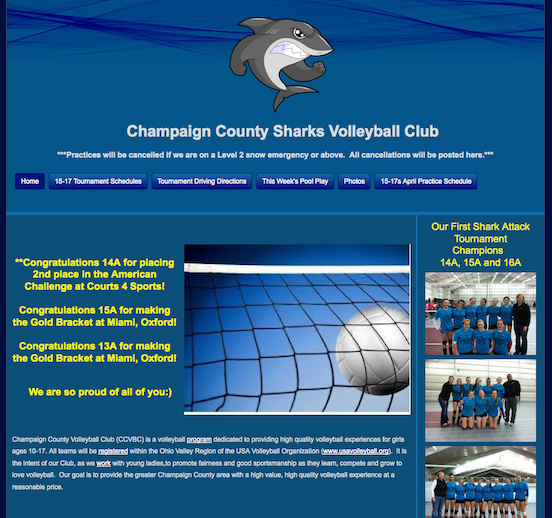 Today’s Featured Friday site is the Champaign County Sharks Volleyball Club. This great site is a terrific resource of information for the hard working volleyball club of the Ohio Valley Region. The Club’s mission is to promote good sportsmanship among young ladies and help them develop a love of volleyball and it’s clear they are quite successful in that endeavor. The site’s great design and navigation makes it easy to discover Tournament and Practice Schedules plus learning the current week’s Pool Play. Upon viewing the Photos section, you see how thrilled each team is with their bracket or championship wins! If you have a sports club and want to design a website to help promote your team, their season or highlight their success, then look no further than Champaign County Sharks Volleyball Club for inspiration. Going to be in the Portland area May 19th? You should check out the Signing Time Foundation’s concert featuring Rachel Coleman, Emmy-Nominated star of the PBS show “Signing Time”. The site provides the details for this tremendous event and ways you can help either by volunteering your time or donating to help cover the venue costs. The organization is dedicated to making ASL accessible to all families and there are such benefits to signing to all children, not just those who are deaf or hard of hearing. Learn more about Rachel’s personal experiences and how Signing Time came to be. Support this amazing group that wants to help create a world where all children can express themselves.